A 13 km journey that covers Banganga, the Adhkawari cave, Sanji Chhat, Bhawan, the shrine and the Bhairon temple. The entire route has been widened and tiled recently. It is also well-lit at night with sodium vapour lamps. Other facilities include, rest shelters, cafeterias, drinking water fountains and coolers and a public utility with an automatic flushing system. The yatra begins at Katra as pilgrims go on foot to reach the darbar (the sanctum sanctorum). A kilometer away from Katra is the Banganga, the place where the Mata is believed to have quenched her thirst (see legends). Six km away is the holy cave at Adhkawari. Produce the free yatra slip (collected from the Yatra Registration Counter at the Tourism Reception Centre, Katra Bus Stand) which allows you to cross the Banganga checkpost. 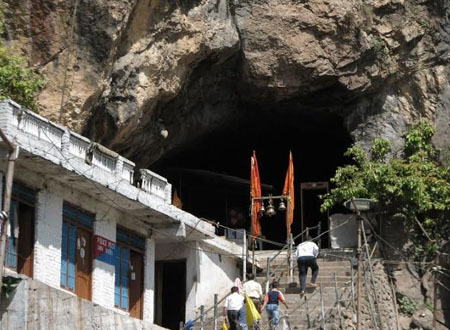 After a six km trek, you reach Adhkawari, the holy cave where Mata meditated for nine months. Another 9.5 km takes you to Sanji Chhat where you can rest for sometime. Accommodation is also available at this place. Bhawan is just 3.5 km away.On reaching Bhawan, show your Yatra Slip at the Registration Office and take down your batch number. This number is important as it will determine your place in the queue for darshan (glimpse of a deity or saint).At Bhawan, you can bathe and change. All leather items and luggage can be booked here in the cloak rooms. Book your valuables separately. Preserve both the receipts. You can also collect blankets on a refundable deposit of Rs.100 from here. Offerings like prasad (food blessed in temple sanctuaries), chunri (veil for the goddess) and coconuts can be bought here. You can queue up for darshan according to your group number at gate number two outside the cave temple.You will not be allowed to carry the coconut into the narrow cave. Deposit it before entering the cave and collect your token. In a bid to keep the shrine clean, your blessed coconut can be collected on your way out after darshan. The prasad of sweets can be carried inside. Inside the cave, the goddess exists in her three pindi forms -- Mahakali, Mahalakshmi and Mahasaraswati. The water at the feet of the shrine is believed to be holy. The yatra is considered complete after a visit to the shrine of Bhairon on the return journey. Bhairons Shrine is 2.5 km. from Bhawan. It is important to collect your belongings deposited at Bhawan before leaving, as the return path follows a different route. The Bhairon shrine joins the main path at Sanjhi Chhat. The place where compassion triumphed over rage. When Vaishno Devi slew Bhairav, this is where the head landed. It is called Bhairav Ghati. The temple has been constructed at the same spot. The body of Bhairav remained near the cave and the huge stone, outside the cave is a symbol of Bhairav's body. Legend has it that while dying, Bhairav prayed to the mother for mercy. He is believed to have said, Mother, I am not mourning my death as I have died at the hands of mother creator. I only beg your forgiveness. I did not understand you were a goddess in the form of a human. If you do not forgive my sins, the world may hate me. His boon was granted and today people throng here for darshan. After breakfast, transfer to airport for Jammu. Arrive Jammu and transfer to Hotel and deposit your baggage with hotel security and leave for Vaishno Devi which is 61 kms from Jammu. After resting for some time and leave for Katra. 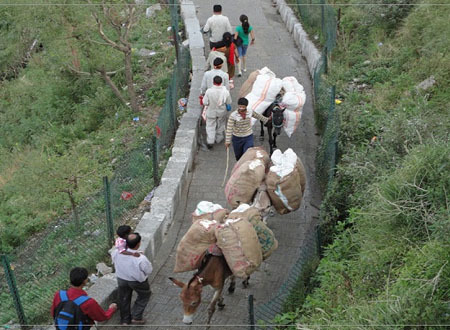 Arrive Katra at about 1900hrs and begin the Yatra on foot to the temple of Vaishno Devi (14kms/6hrs Trek). 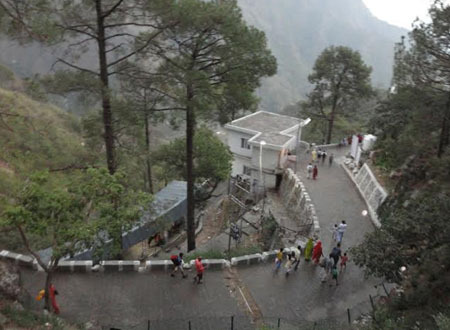 Arrive at the temple of Vaishno Devi - world famous holy shrine where your prayers are answered. 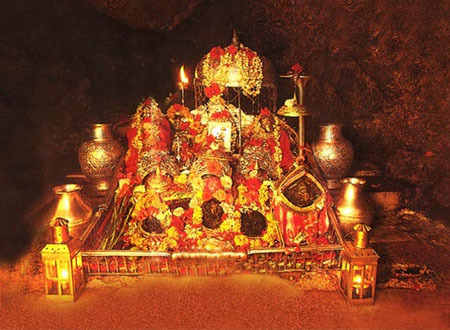 The legend runs that over seven centuries ago Vaishno Devi was an ardent devotee of Lord Vishnu. Bhairon Nath, a tantric, was bewitched by Vaishno Devi and gave her a chase when she was going towards Trikuta Mountains. When thirsty, the Goddess shot an arrow into the earth and water gust-out at the place where the Ban-Ganga exists today. The imprints of her feet marked the spot Charan Paduka where she rested. She meditated in the cave at Adhkwari. Since Bhairon Nath took nine months to locate her, the cave is called Garbh Joon. When found by Bhairon Nath, the Goddess made her way out by blasting an opening with a trident. When she arrived at the holy cave at Darbar, she took the form of Maha kali and chopped-off the head of Bhairon Nath. A temple after his name stands where the head fell on the ground. We spend about 2-3hrs at the temple for Darshan and Prasad and walk back to Katra . After visiting Katra leave for Jammu arriving in the hotel by afternoon. After an early breakfast depart for a full-day excursion to Patnitop (112kms). With all the exquisite beauty of a hill-station, it is a charming little plateau at an altitude of 1950m, where the time seems to stand still. 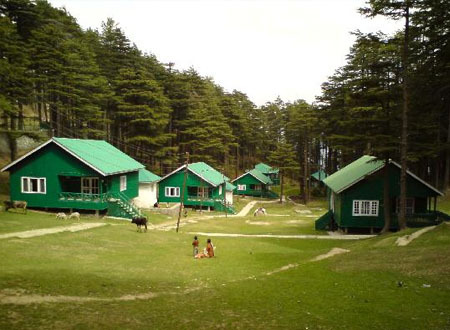 The meadow is surrounded by dense woods and lush greenery of tall pines. After enjoying at Patnitop drive back to Jammu arriving late in the evening. After settling down in Hotel depart for sightseeing of Delhi visiting religious sites. After leisurely breakfast, transfer to airport in time to catch flight back home.